I planned the meal so that we could do with just a white, and chose the Salomon, Kremstal DAC Reserve, Lindberg, Gruner Veltliner, 2012 as I felt I'd been deprived of Austrian whites for the last couple of months. This should be accompanied by a short user's guide: Wait for the reductive stink to settle and you'll get lime, melons, chalk, ensconced in a leafy, mentholated envelope. Since the bottle didn't last the whole dinner, and since my sister wanted a red with her pork chops, I ordered her and myself a glass of Michele Chiarlo, Barbera d'Asti, l'Orme, 2011 each. This is full of friendly, leathery black fruit - musky, dusty and spicy like Nebbiolo without as much tannic palate pressure. And it somehow managed to pair decently with my coquilles saint jacques on black risotto. As an appertif, I had a glass of Williams and Humbert, Pedro Ximinez, 12 años. I hadn't had this ages. This was always fun, and it still is, dark chocolate with that typical grease oil and chili you either hate or love. Bourgogne Crown, 120 NIS. This is just as good as the Leroy Aligote, which costs twice as much. Different, but just as good. Fat Guy, about 120 NIS. Louis Roederer, Reims, Brut Premier, n.v.
Wine Route, 370 NIS (250 on discount). 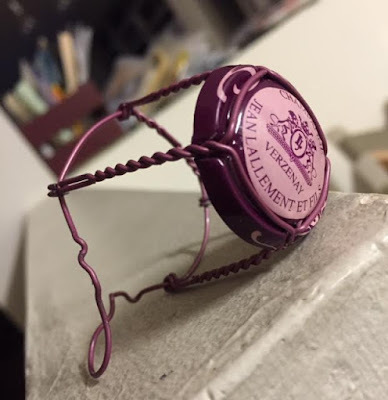 Jean Lallament, Verzenay Grand Cru, Réserve Rosé, n.v.